For many years, the only treatment options for people with missing teeth were bridges and dentures, but today dental implants are a great option. At Lee Dental, we work in conjunction with several oral surgeons and periodontists in the area to offer the best in dental implants so you can smile with confidence again. Dental implants are replacement tooth roots that provide a strong foundation for fixed or removable replacement teeth that are made to match your natural teeth. Implants are designed to fuse with your bone so they become permanent. Unlike bridges, implants do not rely on neighboring teeth for support. Poor fitting dentures can be uncomfortable and look unnatural. Implants are designed to match your natural teeth and because they become permanent, they act just like real teeth. Dentures can slip, causing you to mumble or slur your words but dental implants stay in place so you can speak with confidence. Chewing can be difficult with dentures but with dental implants you can chew just like you have real teeth again without any pain or discomfort. Unlike with dentures or bridges, implants are individual so you can floss between all of your teeth, improving the overall health of your teeth and gums. 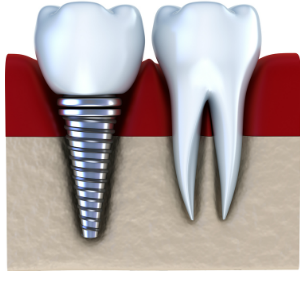 Dental implants are not a same-day procedure, it takes time for the implants to fuse to your bone. Typically the treatment is done in three stages over 3 to 6 months. The first stage may require going under anesthesia for the placement of your implants but most patients experience minimal post-operative discomfort. The next stages include uncovering the metal posts for your new teeth and fitting your new teeth to the implants. If you have one or more missing teeth and are in good general and oral health you may be a candidate for dental implants – talk to us at your next routine appointment or call today.